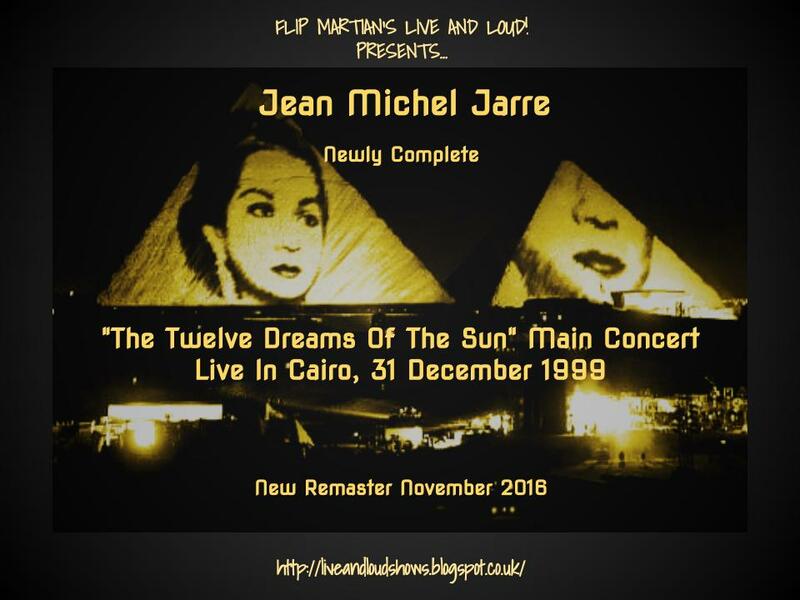 A concert by Jean Michel Jarre, which went by the name of The Twelve Dreams Of The Sun, and performed at the Pyramids of Giza, Egypt; starting on 31 December 1999 and carrying overnight into the new millennium, attended by 120,000 people and broadcast to TV stations around the world. The concert consisted of two parts, the Main Concert and a Sunrise Concert performed the next morning, and came about when Jarre was contacted by the Egyptian president Hosni Mubarak with a special project to celebrate the dawn of the new Millennium at the foot of the only remaining monument of the original 7 Wonders of the World - the Great Pyramids. I went back to the original files and did it all again. All 39 files blended to 1 file, then carefully EQed and remastered once again. The original recording is in mono, so this time I took the opportunity to do a better simulated stereo remaster as well. So now you have a choice, you can have it in unwidened mono, or you can have the "stereo" version which I think sounds better. Or...you can download both! Both are available as 1 MP3 file. Or, if you would like to have separate tagged MP3s, or even lossless files in FLAC format, head on over to the Donations tab to see how you can obtain these for a very small donation towards the site costs.